The first attempt multiplied number of areas, number of nations, and number of turns. I added number of players to that, though most of these games are four-player. (I understand 3 player Maharajah is better than 4. I don't know of any game that is best with five.) This gives 40,256 for B2 (37 areas, 17 nations, 16 turns, 4 players). I am not including sea areas because no conflict can occur there, in effect they are merely staging areas. What I really wanted, though, is average number of pieces on the board, as a gauge of complexity, rather than number of areas. But I only know those averages for a few games, so at first I was supposing that number of areas would be proportional to number of pieces. However, in "Euro-ized" games, especially ones not using dice, the number of pieces per area may be significantly lower. At some point I recognized that it may be average number of nations on the board, not total in the game, that really counts (since we're accounting for number of turns separately). This is around nine in Brit, and I can derive some figures for my other games to make comparisons. However, average number of pieces is the best gauge of complexity of movement, so how much one should count the number of nations is open to question. At that point I have a formula which is average number of pieces times number of turns times number of players. This latest formula yields 2080 for Caledonia(TM), which is certainly a much shorter game than Brit (3328). I don't know where this has brought me, other than to realize that my Viking Brit may have a length problem (haven't played it yet). Hellenia (TM) comes up large on the originla formula numbers (5,100 on the latest formula), but doesn't seem to be all that long a game; I think that's because there are no big invasions and only a few minor ones, as opposed to Brit where we have big invasions that tend to take a long time to play out. Moreover, in Hellenia(TM) the Hellenistic nations often receive few new pieces each turn owing to the economic system. So my formula may need yet more of a tweak, including something like how many new armies come on the board during a turn whether from appearance (Invasion) or from Increase. I tried running a formula for Diplomacy, which averages 33 pieces, has 7 players, and lasts about 22 turns (maybe less). That yields 5,082, to 3,328 for Brit. But Diplomacy is a simultaneous-move game; OTOH it emphasizes negotiation, which takes a long time. At any rate, I'd certainly agree that Diplomacy is a longer game than Brit, in general. Another impracticality: it's easy to count number of areas and number of nations, but harder to know the average number of pieces and average number of nations (I do count, sometimes, in solo play). There are several online sources. USENET rec.game.design is mostly useless, often overrun with junk. Someday I may have a book out about the nuts and bolts of game design. There are no "nuts and bolts" books presently available, though there are many books that talk about games, analyze games, and talk about computer games in particular. They are not "how to" books, for the most part. Check Amazon for a selection. First, I believe that you must write everything down (or perhaps I should say, record it). You may have an idea that you'll never have again--do you want to lose it? Moreover, when you write down your ideas, reading them can stimulate yet more ideas. Of course, writing down ideas forces you to actually figure out and understand what you mean; so many novice designers have "ideas" that are only in their head, and when they're asked to articulate them, they find out that there's a lot they haven't figured out. Similarly, when playtesting you should write down anything you want to keep track of. I keep printed copies of the rules at hand so that I can change them, or I write all notes on scrap paper and then, after the game, transfer to computer. Recording ideas starts with my PDA, which has a one touch record button (not all do). This allows me to "leave voice messages" to myself, so to speak. I can press the button, talk, and when I let it go it stops recording--the only reasonably safe way to record things during my 50 minute commute. I transfer these to my desktops (gives me three copies, one in the PDA, one at home, one at work), and then write the information down (on computer) when I have time. I rely heavily on a program that has been around for a very long time but is not well known, Info Select (www.miclog.com). This is a free text database program. It not only allows me to organize information, it allows a full text search in the blink of an eye (because all the stored information is loaded into memory). You might think this would take a lot of memory; no, an entire novel is roughly one megabyte of text, so as long as you don't store a LOT of graphics, it won't put much of a dent in your RAM. Microsoft OneNote is another program somewhat like this. I'm sure there are others. I also have a paper spiral notebook, for occasions when I'll be away from home for a while but don't want to wield a laptop computer. So when I have an idea I record it, then copy it to other places, and ultimately get it into Info Select. At some point I try to write rough rules, as opposed to notes, in these same notes (or in new ones). I can color code the notes accordingly. I write actual sets of rules in WordPerfect (Microsoft "Worst" is not my favorite word processor). Much of the preliminary writing is done in Info Select, then transferred. But there are many, many revisions to a set of rules, and those are done in WordPerfect. I am not fanatical about it, but I usually save each significant revision as a new file, so in the course of designing and developing a game I might end up with 20 versions. WordPerfect makes it easy to make usable cards for games. I print on business card stock using the WP template, then put the cards in collectible card protectors (which can be had pretty cheaply, on sale, at Dave and Adam's Card World on the Internet, or at conventions sometimes). The protectors make the cards easy to shuffle, the card stock gives them sufficient stiffness. These are text-only cards; I've seen many prototypes with beautiful graphical cards, but I am not interested in spending the time needed to do this, preferring to concentrate on game play. Moreover, if I did spend a lot of time on a playtest prototype, I'd be reluctant to change it, and that is truly a Bad Thing. Change is the norm when designing and developing games. I work on about 30 games in the course of a year, and there are many more than that in some stage of work. I really need something to organize what I'm doing, and this helps a lot. Another time I'll describe how I cope with pieces and prototypes. Many people remarked that the game is too long, and that is addressed in "Brit Lite", which may someday be published. There is some sense that Britannia is an extraordinary game because it is long, giving it the feeling of the "sweep of history" over centuries. In that respect it's like a mini-Civilization: some people cannot conceive of a game being like Civilization if it isn't at least four hours long (it often goes 8-12). I think that a shorter Brit must have a combat system that has less standard deviation. About 80% of the players responding to my Web survey (http://www.surveymonkey.com/s.asp?u=504421468301) think the amount of chance in Brit combat is OK (all but one of the rest think there's too much luck). In Brit the dice rolls tend to "even out" (but only tend); in a shorter game this would not be so, hence a different combat system is desirable. My experience playing short Brit scenarios I'm working on confirms that a few good dice rolls can have a major effect in a short game. I have three combat systems that involve less luck (one uses no dice, but is not luckless). The diceless one is used in Brit Lite. "Advanced Britannia" will probably use the standard system. Other (dice table) systems are used in Dark Ages (TM) and Hellenia (TM). Someone mentioned an innovative "for it's time" mechanic used (and I think the reference was to the point system). I confess that I've never cared whether a mechanic was innovative or not, as long as it modeled reality well or worked well for the game, but nowadays, as someone pointed out, some people admire games for the mechanics rather than the modeling (reflection of reality). I suppose there are some "Euro" aspects to Brit (no player elimination, usually short downtime between your turns), and I continue to try to think of ways to make this type of game more attractive to the "Euro" crowd. 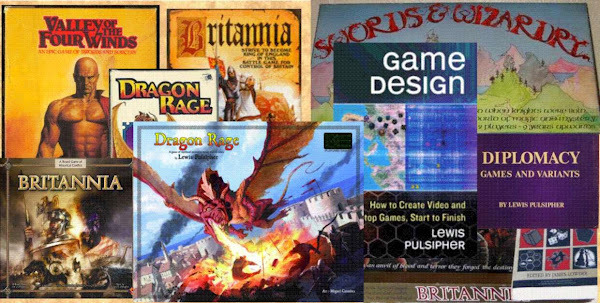 Lots of Euro methods and characteristics were used in games before ever "Euro" games existed. I think there's an attraction here that is the equivalent to the attraction of designer jeans. Sorry, I NEVER bought anything because it was "designer" clothing and never will. I care about how good it is, and I know that many "designer" garments are identical to non-designer garments except for the label. "I begin to think that the only way to get a lot of games published is to design but not develop them." After my conversations at PrezCon, I am even more inclined to that opinion. I talked with some developers and manufacturers about games, of course. The conversation turned at one point to prolific wargame designers. There is one (call him "X") whose games I have never played, but I have read several sets of the rules. They always give me the feeling that the "game" is actually a simulation first, game second; and from various readings, plus my own impressions from these rules, I felt that the games probably weren't well-playtested, and probably weren't much fun as games. Opinions ran even more strongly at the con. One person was of the opinion that only good developers could save games designed by X. He thought X does hardly any actual playtesting. Another called X a "one book wonder", that is, he'd read one book, design a simulation, maybe play it a little, then pass it on to the developer who might or might not make a good GAME of it. As this all jived with my impressions (and they can be no more than that), I wasn't surprised. Someone talked about another designer (call him Y) who delivered his "design" as "a box of notes". Yet, this person felt, better games came from Y than from X. And Y could be paid a small lump sum rather than a designer's royalty. Jim Dunnigan of SPI fame--SPI appears to have created the concept of "developer"--compared the developer to an editor (or in computer games, a producer); the expectation at SPI was that the guy doing the research would only come up with some sort of decent prototype, perhaps 80% complete, not publishable as is. The developer would do the work to make the game playable. There is no doubt that the last 20% of refinement of a game takes 80% of the time. Playtesting is time-consuming, tweaking rules is time-consuming. Even when you don't intend to change the rules, rewriting them introduces unintended consequences (as evidenced by the Britannia Second Edition rules rewrite by FFG--and then having no testing of the new version of the rules compounded the problem). When you rewrite to change a rule, the repercussions are often larger. So a remarkable amount of testing is needed. At some point recently I've also realized that, while delivering the "80% finished" game is far more practical than delivering 100%, to some manufacturers it doesn't matter. They are going to change it, and possibly not playtest the changes, whether the designer likes it or not. I remember talking to Andy Lewis of GMT two years ago at PrezCon, and being put off by the assumption that a developer would likely need to change the game. Now that I've heard more about some of the well-known current designers, I'm not so surprised by the notion. This reminds me of my experience as a freelance writer long ago. I actually had "editors" change my correct spelling to incorrect! Some editors are more interested in fitting an article in a space than the meaning of the article. Some, on the other hand, make useful suggestions, and I am open to suggestions. What I'm not open to is someone changing something in a way I disagree with: it is MY GAME. At this point some people might say, "get a grip, as long as it's published you'll get paid". However, I'm not in this to make money (very few do, and as one person said, you could spend the time scavenging bottles for deposit and aluminum cans for recycling and make as much money). I'm in this because I saw how much people enjoyed Britannia many many years after it was released, and I wanted to do more of the same. That means it is indeed MY GAME and I want it to be right (Britannia as originally published isn't quite right--changes by publishers). Some publishers routinely minimize the importance of the contributions of designers, and assume that they know better. Perhaps the trick is to find the publishers who, if they don't like what you submit, won't try to change it to their way of thinking, they'll just say "no thanks".